Home | Voting Instructions | Cases | Vote Now! TD's promise to their banking customers is to provide the most comfortable, personable banking experience that they can. This promise expands beyond the four walls of TD branches into the environment, which directly affects all aspect of Canadians' lives. Supporting environmental initiatives in local communities is a core element of TD's Environmental approach. The 2013 TD Forests Campaign built on the awareness garnered from the programs 2012 efforts with a specific focus on urban forests. Forests are not just something that exists far away and in large scale, but are something that impact us all in our everyday lives, even in the city. The objective of the campaign is to bring this idea home to consumers and create meaningful connections to forests in their local communities. TD has made a $13 million commitment to grow and protect forests, partnering with the Nature Conservancy of Canada to protect more than 2 football fields each day. In addition, TD is helping to grow our urban forests with TD Tree Days, employee tree planting events and TD Green Streets (a grant program for municipal forestry initiatives). In September 2013, over 45,000 trees were planted across North America during TD Tree Days. During the summer of 2013, the TD Forests campaign's focus was not only to educate consumers on the importance of local green spaces, but to drive consumers to take advantage of urban forests located in their communities. This was done through experiential executions that were found in four major Canadian metropolitans: Montreal, Toronto, Calgary and Vancouver. Consumers were also driven to www.tdforests.com, through online and offline collateral, where they could educate themselves on local green spaces and how to volunteer for other FEF campaigns, such as TD Green Streets and TD Tree Days. A particularly unique execution was the TD Forests vending machine, located on Queen Street West, near Trinity-Bellwoods Park in Toronto. The solar-powered vending machine dispensed TD branded items, each costing a dollar, which could be used at the park. This dollar went directly towards Nature Conservancy of Canada. Items included: sunglasses, lunch boxes, beach balls, kites and Frisbees. 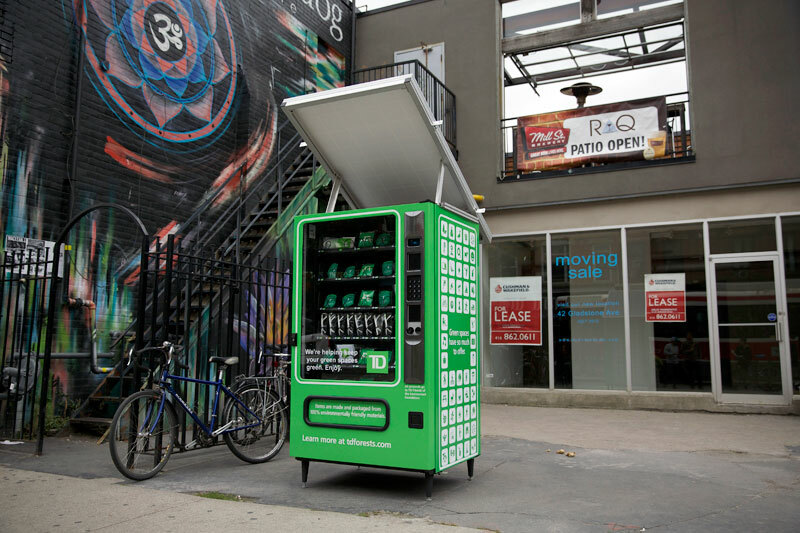 The vending machine, located in an empty lot in the high-traffic retail Queen West neighbourhood, piqued passer-by's attention and attracted any local citizen to participate and educate themselves on TD's efforts. The vending machine also included a map of the area, indicating the park, where these items could be enjoyed. 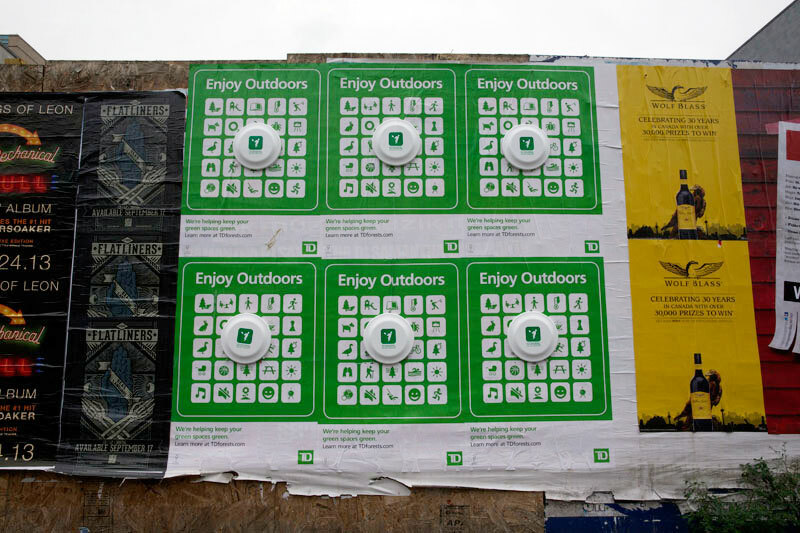 A second unique execution were the "Wild Postings", 19 located around Toronto, 10 in Montreal, 10 in Vancouver and 5 in Calgary. These OOH Posters were strategically located in high-traffic areas, with a green space in close proximity. Placed at eye-level, they offered branded Frisbees and kites to any passer-by, to be enjoyed at the urban forests close by. Digital and OOH executions indicated how close the nearest green space was to the consumers location. 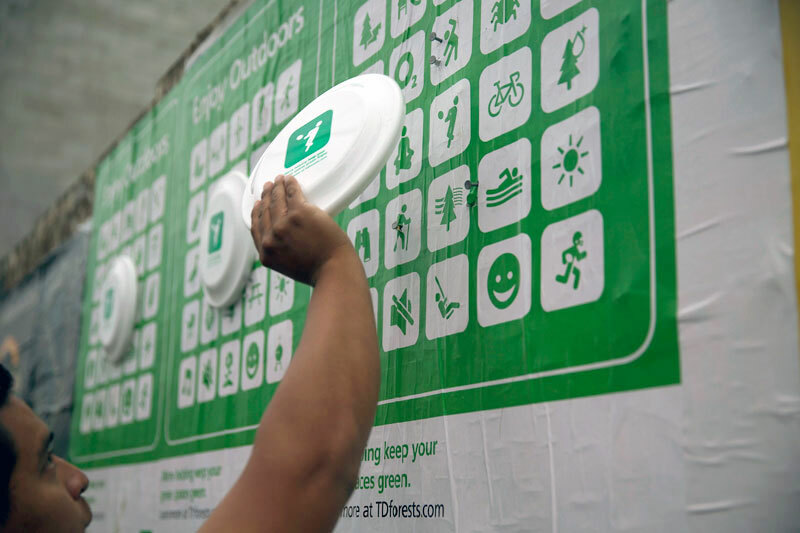 Whether it was an out-of-home graphic map, highlighted the nearest park or a digital banner that pin-pointed the closest green spot, consumers were reminded of local urban forests that they may have forgotten were located near them, or never even knew existed. Other marketing efforts included in-branch signage and merchandise, digital and social postings, which not only encouraged consumers to get out and enjoy their local urban forests, but engaged the consumer to learn more and get involved by volunteering at a TD Tree day event. Return to Cases . . . Vote! ™ cause + action Awards is a trademark of Brunico Communications Ltd.